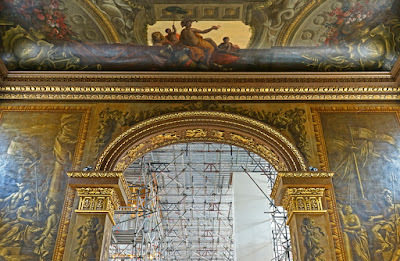 The stunning Painted Hall of the Old Royal Naval College has entered a new phase of conservation work. 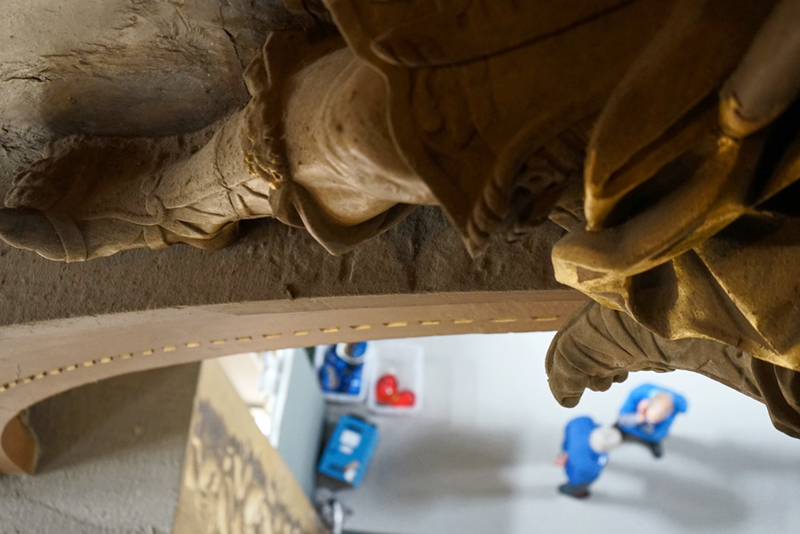 After the newly-bright West Wall was unveiled, cleaned and conserved, it's now the turn of the main hall. 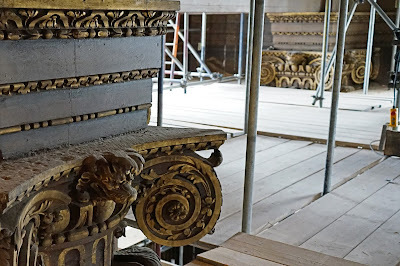 Scaffolding fills the space, giving access to the elaborately-painted ceiling. 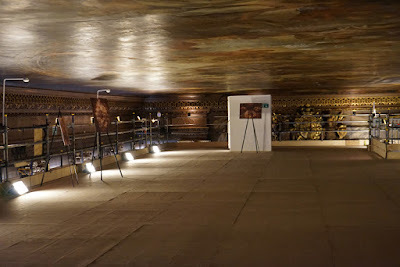 Thanks to the Ceiling Tours running regularly throughout the process, we have the opportunity to get incredibly close to painting we normally only get to see from ground level. 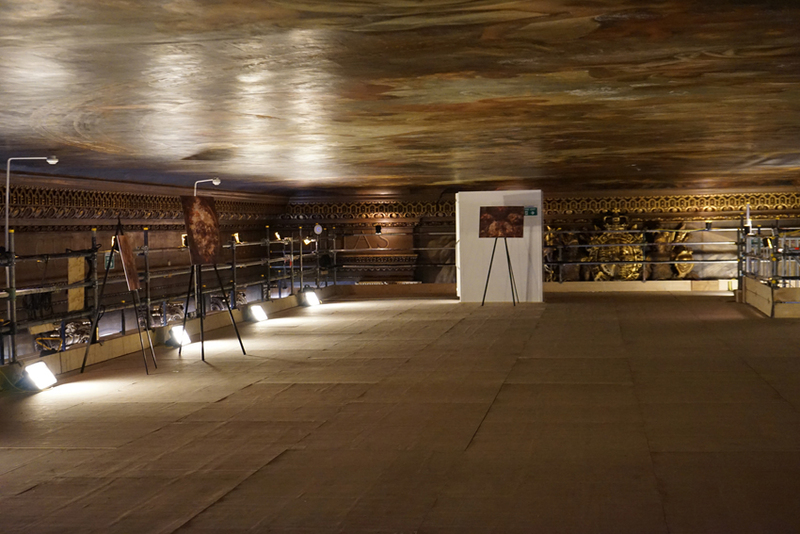 Stood so close to the ceiling that you could touch it, details which are usually invisible to us can be appreciated. 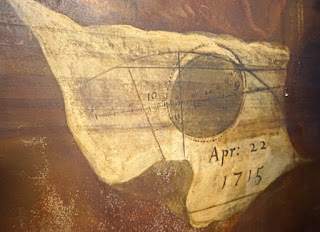 The total solar eclipse of 1715 was most famously predicted by Edmond Halley (better known for his comet). However, this paper marking its passage is in tribute not to Halley but to John Flamsteed, the Astronomer Royal - who also correctly predicted the eclipse. In fact, it was painted the year before it happened. 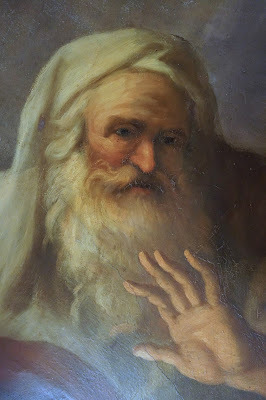 He must have been pleased to get credit here, since he felt his rivals had stolen it from him elsewhere: his lunar observations had been vital to the work of Sir Isaac Newton, published by Halley. Flamsteed didn't believe he was properly credited for them. Worse, Halley and Newton then printed his catalogue of the stars without his approval. 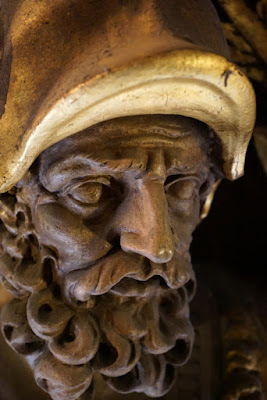 This detail of the ceiling represents a small compensation! Perhaps my favourite usually-unseen detail was this tiny dove on Queen Anne's sceptre, too small to be spotted from the floor below. It's perhaps just as well that some details aren't usually visible. 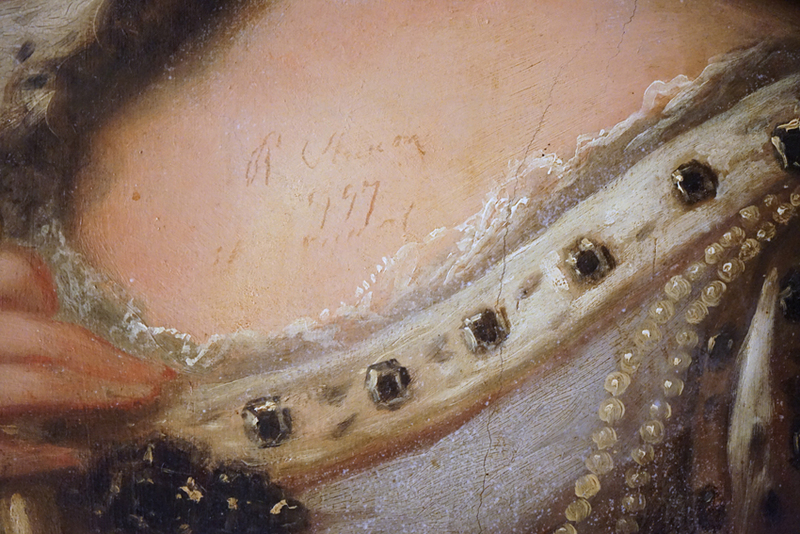 A restorer wrote details including the date right across Queen Anne's cleavage! There's also the chance to get a closer look at favourite details. The model for Winter was John Worley, known as one of the first and oldest pensioners in the Hospital - and one of the most badly-behaved. 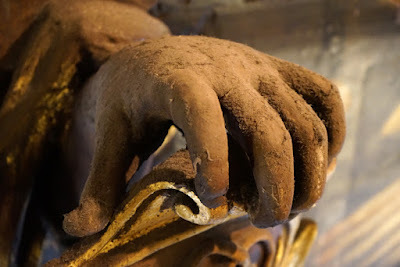 ... and a reminder that normally, there's no access to it for dusting! 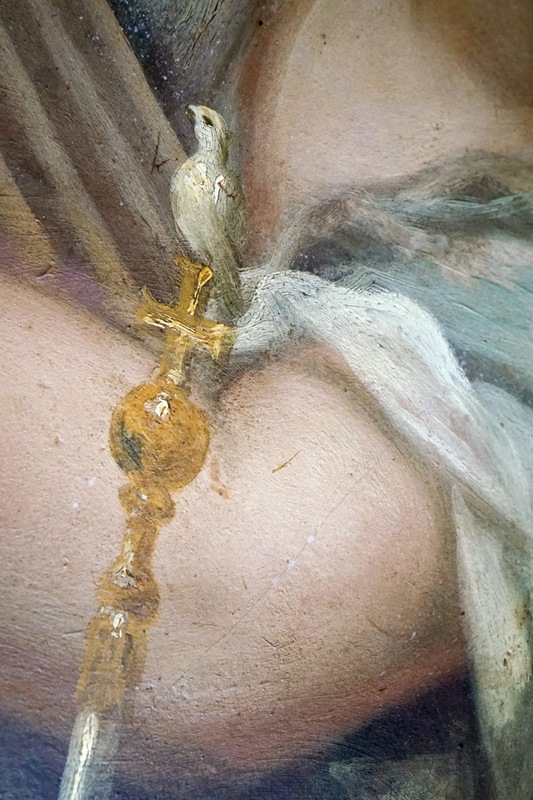 Unfortunately, we can also see the dirt and damage currently detracting from the painting's impact. 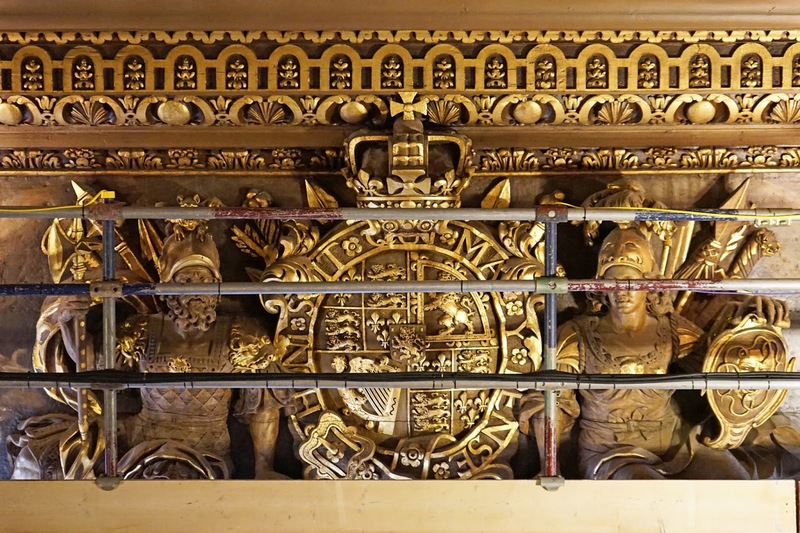 This baroque masterpiece has been in place for three centuries, and undergone earlier restorations, so it's unsurprising that there are issues such as blanching (where fractured varnish creates the white spots visible up close), as well as the effects of city pollution, pre-electric lighting, and dinners held before the smoking ban. 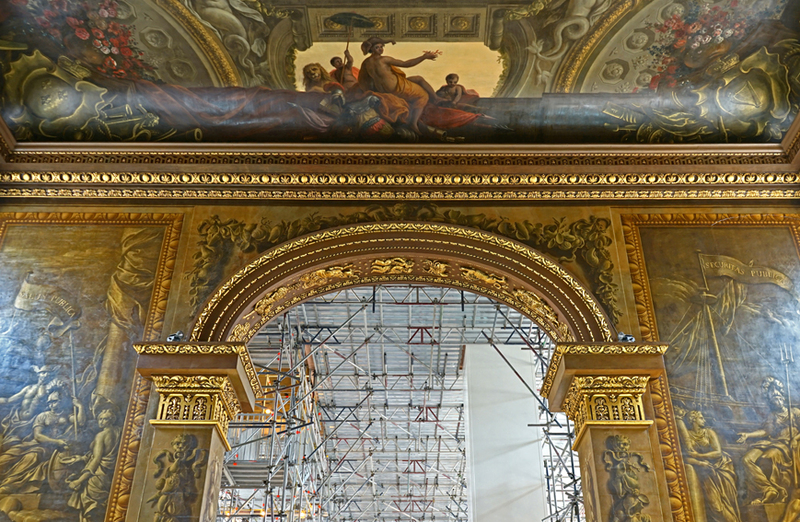 The final stages of the Painted Hall project will involve environmental control measures, as the highly variable conditions in the large, window-filled hall pose an ongoing challenge to the art. Altogether, this work should ensure that further conservation is not needed for several generations - so the current project is a once-in-a-lifetime chance for us to get this close to the Baroque masterpiece. 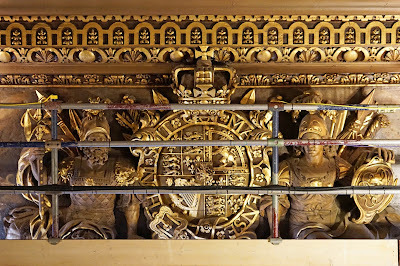 Tickets for the Ceiling Tours can be booked here. Thank you for inspiring us to make a visit, our guide was very informative and it was the highlight of a day trip to Greenwich. On our 1:40pm 12/5 tour there were only 4 of us, although the earlier and next tours seemed to have about 20 people. Lovely post, thank you. I love the dove on the sceptre. Poor old Queen Anne, though. What a lot she had to bear, and now someone has written the date on her cleavage! 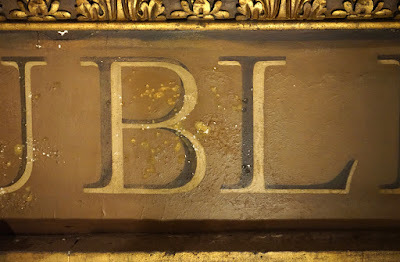 Perhaps it should be left here, as a part of the painting's history. 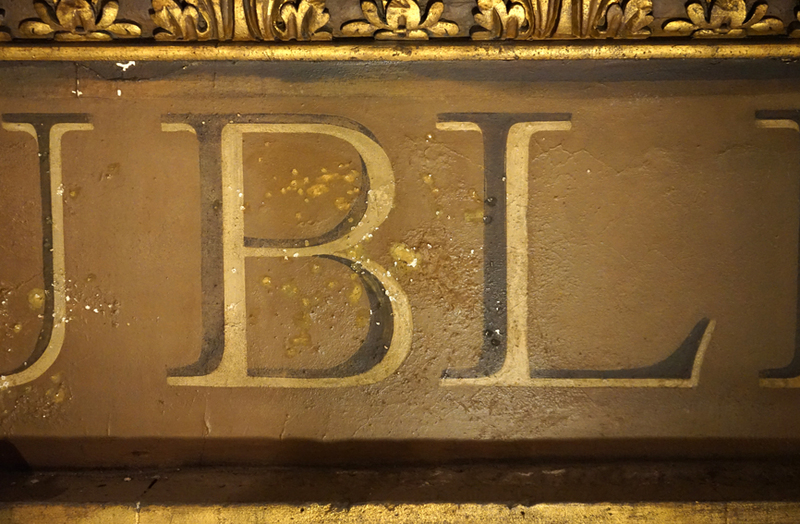 I believe they're leaving it there, but not planning on adding any further graffiti for this restoration! Cliff, I'm glad you had a good visit. Our guide was very good, too; we would have been full at 10am, but there were a couple of no-shows.